Too Hot was a hit for the huge Kool and the Gang album ladies Night which was released in 1979. The single was released in 1980 and the song reached No 5 in the US Billboard Top 100. Like all Capitol.fm’s Bangkok Hitz it’s a song about live. The lyrics talk about a school romance at 17 years of age: At seventeen we fell in love, Highschool sweethearts, love was so brand new,We took the vows of man and wife, Forever, for life. 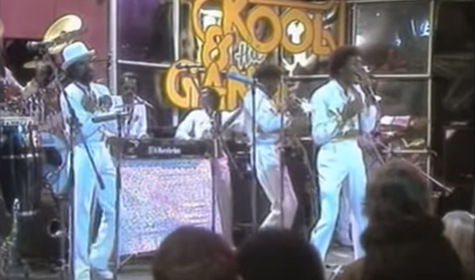 Kool and the Gang perform Too Hot in front of an enthusiastic crowd. The song with smooth vocals was a love song about High School love that fitted well into the sweet loving sound of 70s and 80s disco. The song was released on January 13th 1980 at a time of momentous change with US President Jimmy Carter just about to begin the last year of his Presidency although he didn’t know that yet. The song was released as a 45 rpm single by the record label De Lite on January 13th 1980. President Carter was the US President and three days later Paul Mccartney would cause a worldwide media sensation when he was arrested in Tokyo for possession of marijuana, Margaret Thatcher had been installed as UK Prime Minister and there was a great debate over whether to boycott the Moscow Olympics due to soviet intervention in Afghanistan. Jimmy Carter was about to begin the last year of his US Presidency although he did not know that yet. Kool and the gang were playing Too Hot on the radio and discos worldwide. Back in 1980 the discos and the lounges were music player were smaller and more intimate. It was a smooth disco sound and at that the time the band were joined by such acts as Rick James, the Gap band and the Pointer Sisters, The lead vocals of JT Taylor on this tracks are simply Too Hot. The song, like many for the disco era, is about love, a sweet sort of love that seems to be lost in today’s world. Kool and the Gang were a huge disco band in the late 1970s and early 80s with other great hits like Ladies Night, Celebration, Let’s Go Dancing and another Capitol.fm power play Stepping Out.